This Contest is open only to legal U.S. residents age eighteen (18) years or older at the time of entry with a valid Social Security number and who reside in the Station’s Designated Market Area (“DMA”) as defined by Nielsen Audio, who have not won a prize from the station in the last 90 days or a prize valued at $500 or more in the last 180 days, and whose immediate family members or household members have not won a prize from the station in the last 90 days or a prize valued at $500 or more in the last 180 days. Void where prohibited by law. Employees of Cumulus Media, its parent company, affiliates, related entities and subsidiaries, promotional sponsors, prize providers, advertising agencies, other radio stations serving the Station’s DMA, and the immediate family members and household members of all such employees are not eligible to participate. The term “immediate family members” includes spouses, parents and step-parents, siblings and step-siblings, and children and stepchildren. The term “household members” refers to people who share the same residence at least three (3) months out of the year. The Contest is subject to all applicable federal, state and local laws and regulations. Participation constitutes entrant’s full and unconditional agreement to these Official Rules and Sponsor’s decisions, which are final and binding in all matters related to the Contest. Winning a prize is contingent upon fulfilling all requirements set forth herein. Contest Period. The Contest is an on-going contest with no definite termination date that runs Monday-Friday at 9:00 a.m., 10:00 a.m., 12:00 p.m., 1:00 p.m., 3:00 p.m., 4:00 p.m. and 6:00 p.m. CST (“Contest Period”). 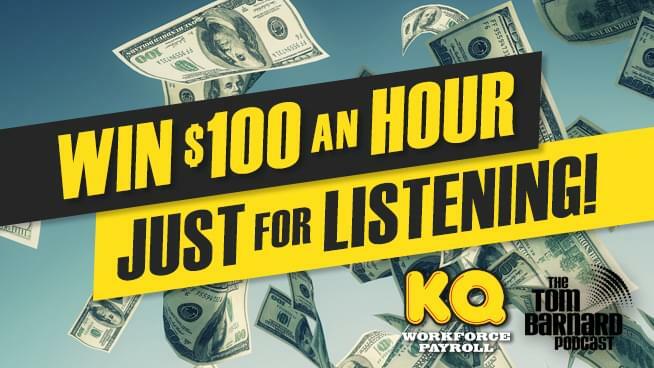 (i) Visit the Station’s website at www.92kqrs.com and complete an online entry form by clicking on “Contests” and then click on “Workforce Payroll” to fill out the required information to complete your application. (ii) Mail a 3×5 card to the Station at the address above containing the following information: name, workplace and location, and phone number. (iii) Fax in your name, workplace and location, plus a phone number to the KQRS Studio Fax number at 612-676-8292. How to Win an Hourly Prize. The Station will randomly draw one name out of all submissions received per date and per time, Monday through Friday, at the hours of 9:00 a.m., 10:00 a.m., 12:00 p.m., 1:00 p.m., 3:00 p.m., 4:00 p.m. and 6:00 p.m. during the Contest Period. When the Station announces on-air the entrant’s name and employer (or “unemployed,” as applicable) as the potential winner for that hour, that selected person should call the Station at 651-989-7625 within ten (10) minutes to potentially claim the $100 Hourly Prize “Hourly Prize,” receive one (1) entry in to the Grand Prize drawing and be deemed as an Hourly Winner (“Hourly Winner”). Time Delay Between Over-the-Air Analog Signal and Internet Broadcast: Due to the time delay that exists between the Station’s analog over-the-air signal and the Station’s online webcast, listeners who listen to the Station online may hear the cue to call later than listeners listening to the Station’s analog over-the-air signal. As a result, the odds of an online listener entering this Contest on-air may be diminished. If the potential Hourly Winner (whose identity may be confirmed by telephone number and/or email address after calling if there are multiple entrants with the same name and employer), calls back the Station within ten (10) minutes of being announced on-air, as determined by the Station in its sole discretion, s/he will receive a $100 Hourly Prize from KQRS and be entered to win the Grand Prize. This process will be repeated the subsequent hour, and another name and employer will be announced on-air by the Station. If that named entrant does not call the Station back within the ten (10) minute allotment, as determined in the Station’s sole discretion, the previous Hourly Winner will win another $100 Hourly Prize, but will not receive an additional entry for the Grand Prize drawing. This process will continue until another entrant’s name and employer are announced and the selected entrant calls back within the ten (10) minute allotment, as determined in the Station’s sole discretion. No Hourly Prizes will be awarded between 7:00 p.m.-8:00 a.m. during the Contest Period or on weekends during the Contest Period. In addition to the $100 Hourly Prize, the Station will award each Hourly Winner one (1) Additional Prize (regardless of how many $100 Hourly Prizes the Hourly Winner receives) to be announced on-air, up to approximately $300.00 ARV, Examples of the additional prize each Hourly Winner will receive include, but are not limited to, concert tickets, sporting event tickets or gift cards. Grand Prize Winner Selection. All Hourly Winners from that particular week will also automatically be entered into a random drawing to win one (1) Grand Prize (“Grand Prize”), for a total of one (1) Grand Prize throughout the Contest Period. The Grand Prize drawing will be conducted by the Station on the following Monday at approximately 9:30 a.m., CST, with one (1) winner randomly selected from the pool of all qualified Hourly Winners from during the previous week during the Contest Period. The potential Grand Prize winner will be contacted by end of day the following Monday using the email address and/or telephone number provided with the entry and may be awarded the prize (subject to verification of eligibility and compliance with the terms of these rules). Station’s decisions as to the administration and operation of the Contest and the selection of the potential winner are final and binding in all matters related to the Contest. Failure to respond to the initial verification contact within three (3) days of notification will result in disqualification. Hourly Prize. Up to thirty-five (35) Hourly Prizes will be awarded in this Contest. Each Hourly Prize consists of $100 in the form of an American Express gift card made out to the Hourly Winner (with each Hourly Winner potentially winning more than one Hourly Prize if the subsequent potential winner does not timely call the Station as provided in Section 4), and one (1) Additional Prize (to be announced on-air, but examples could include concert tickets, sporting event tickets or gift cards, with ARV of the Additional Prize up to $300 (with specific ARV to be announced at time of award) and one (1) entry into the Grand Prize drawing. Grand Prize. A total of one (1) Grand Prize will be awarded in this Contest. The Grand Prize changes from week to week but examples could include a trip, a four-pack of concert tickets, gift cards, etc., with the ARV of the Grand Prize over $500 (with specific ARV to be announced at time of award). All entrants and winners agree to give the Station and its licensees, affiliates, successor, and assigns the irrevocable and unrestricted right to use, re-use, broadcast or publish their name, city of residence, photo, video tape, film or any other likeness, including portraits and pictures, in whole or in part, as part of a composite, retouches or distorted in character or form, and winner’s voice, recorded or live, for any reason, the Station deems necessary without compensation, unless prohibited by law. All winners release, discharge, and agree to hold the Station harmless from any and all claims they may have against the Station in connection with the taking, production, or the use of winners’ name, city of residence, any photo, video tape, film or any other likeness, including portraits and pictures, in whole or in part, as part of a composite, retouched, or distorted in character or form and without restrictions as to any changes, transformations or alterations, and including winners’ voices, recorded or live. All winners further acknowledge that the Station owns or will own exclusively any photographs of such winners used for such purposes, including the copyrights in them, regardless of the form in which they have been or may be produced and used, and all winners assign all such ownership rights to the Station. By participating in this contest, each participant agrees to waive any and all claims for damages for death, personal injury, loss of property or property damage that he or she may sustain as a result of his or her participation in the contest and/or the use of any prize, and any damages or losses arising from the implementation or carrying out of the contest or any participant’s failure to win the contest or receive the prize, and to release the Station, Cumulus Media Inc. and its subsidiaries, affiliates, directors, officers, employees, agents, and all contest sponsors from any and all liability arising out of or connected in any way with his or her participation in the contest, even though that liability may arise out of an intentional act, omission, negligence or carelessness on the part of the persons or entities mentioned above. Publicity. Except where prohibited, participation in the Contest constitutes winner’s consent to Station’s and its agents’ use of winner’s name, likeness, photograph, voice, opinions and/or hometown and state for promotional purposes in any media, worldwide, without further payment or consideration, unless otherwise prohibited by law. Disputes. Entrant agrees that: (i) any and all disputes, claims and causes of action arising out of or connected with this Contest, or any prizes awarded, other than those concerning the administration of the Contest or the determination of the winner, shall be resolved individually, without resort to any form of class action; (ii) any and all disputes, claims and causes of action arising out of or connected with this Contest, or any prizes awarded, shall be resolved exclusively by the United States District Court or the appropriate state court located in the Station’s listening area; (iii) any and all claims, judgments and awards shall be limited to actual out-of-pocket costs incurred, including costs associated with entering this Contest, but in no event attorneys’ fees; and (iv) under no circumstances will entrant be permitted to obtain awards for, and entrant hereby waives all rights to claim punitive, incidental and consequential damages and any other damages, other than for actual out-of-pocket expenses, and any and all rights to have damages multiplied or otherwise increased. SOME JURISDICTIONS DO NOT ALLOW THE LIMITATIONS OR EXCLUSION OF LIABILITY FOR INCIDENTAL OR CONSEQUENTIAL DAMAGES, SO THE ABOVE MAY NOT APPLY TO YOU. All issues and questions concerning the construction, validity, interpretation and enforceability of these Official Rules, or the rights and obligations of entrant and Sponsor in connection with the Contest, shall be governed by, and construed in accordance with, the laws of the state in which the Station is located, without giving effect to any choice of law or conflict of law rules (whether of the state in which the Station is located or any other jurisdiction), which would cause the application of the laws of any jurisdiction other than the state in which the Station is located. Contest Results. A winners list may be obtained at any time by sending a self-addressed stamped envelope to the Contest Sponsor identified below. CONTEST SPONSOR AND HOURLY PRIZE PROVIDER: Minneapolis Radio Assets, LLC KQRS-FM, 2000 SE Elm Street, Minneapolis, MN 55414.